PDF, or Portable Document Format, is a file format designed to be displayed on a wide variety of software programs and most operating systems. Another advantage of PDFs is that the documents are fairly small, making them easy to email. A downside of the PDF format is that they are not easily edited, although that is changing. 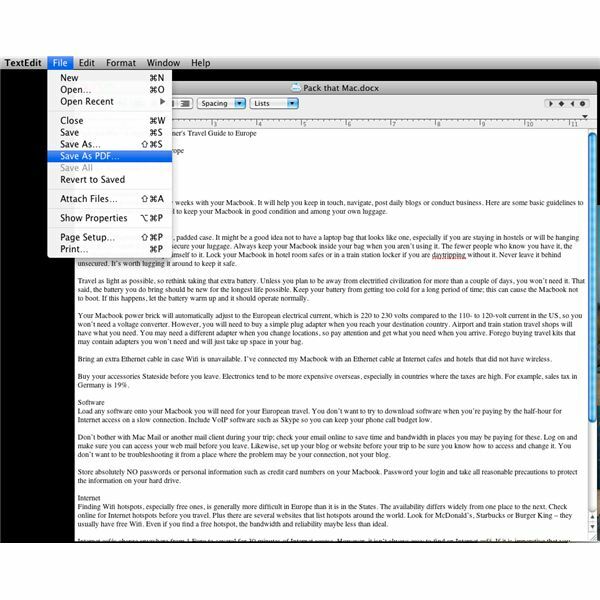 The default viewer for PDF documents in the Mac OS X is the Preview app. So, unless you have changed your default settings, PDF documents should automatically open in Preview. 1. Open the PDF document in Preview. 2. Click File and choose Save As… from the drop-down menu. 3. Change the file name at the top of the Save As box if you want to. Browse the files and folder structure to the location where you want to save the document. 4. Click the field next to Format to drop the menu down and see the formats you can choose from. The choices are GIF, ICNS, JPEG, JPEG-2000, Microsoft BMP, Microsoft Icon, Open EXR, Photoshop, PNG, TGA or TIFF. Click on what you want and then click Save. You can open almost any file in the TextEdit app. Keep in mind that files from word processing programs may lose their formatting or have the formatting code show up as gibberish in TextEdit. Image files will show up as odd text characters and spreadsheet information will not line up correctly. However, TextEdit is included with the operating system and therefore the easiest way to convert PDF on OS X from another format. 1. Double-click TextEdit from the Applications folder to open it. Choose File, Open and browse for the document you wish to convert to PDF. 2. Edit the document, if you desire, to clean up any weird characters. 3. Click the File menu and choose Save as PDF. Change the name of the document in the Save As field if you like. Choose the location to save it in the Where field and click Save. However, without installing any additional software to the OS X environment, you can convert PDF on OS X with these two included apps.